T-lymphoblastic lymphoma (T-LBL) is by far the most common T-NHL in children and adolescents, typically presenting with a mediastinal mass and advanced disease. The molecular pathology of T-LBL is similar to T-acute lymphoblastic leukemia (T-ALL), with frequent activating mutations of the NOTCH1 pathway and signaling kinase molecules, and translocations of the T-receptor gene (TR) loci. There are several recognized differences with the T-ALL genotype, for example, differing patterns of loss of heterozygosity on chromosome 6q (6qLOH) that have been reported to predict prognosis. As in T-ALL, T-LBL can been categorized according to TR rearrangement status and transcriptional profiling. Current treatment efforts are based on therapy stratification according to disease risk, which is principally defined by genotype (i.e., NOTCH1/FBXW7 mutational status). 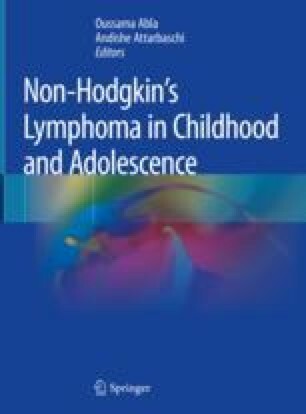 Other T-NHLs in this age group are classified among a heterogeneous group of peripheral T-cell lymphomas (PTCL). Categorization of these rare diseases continues to evolve, in concert with advancements in knowledge of their diverse molecular pathology.